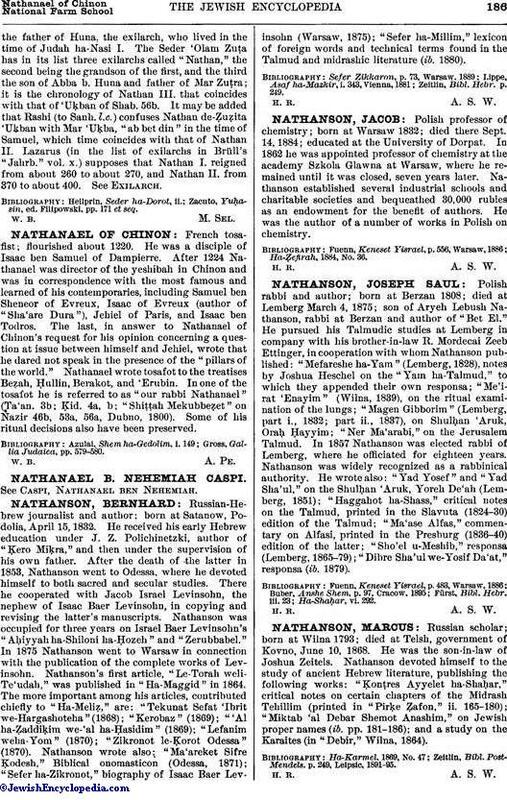 Polish rabbi and author; born at Berzan 1808; died at Lemberg March 4, 1875; son of Aryeh Lebush Nathanson, rabbi at Berzan and author of "Bet El." He pursued his Talmudic studies at Lemberg in company with his brother-in-law R. Mordecai Zeeb Ettinger, in cooperation with whom Nathanson published: "Mefareshe ha-Yam" (Lemberg, 1828), notes by Joshua Heschel on the "Yam ha-Talmud," to which they appended their own responsa; "Me'irat 'Enayim" (Wilna, 1839), on the ritual examination of the lungs; "Magen Gibborim" (Lemberg, part i., 1832; part ii., 1837), on Shulḥan 'Aruk, Oraḥ Ḥayyim; "Ner Ma'arabi," on the Jerusalem Talmud. In 1857 Nathanson was elected rabbi of Lemberg, where he officiated for eighteen years. Nathanson was widely recognized as a rabbinical authority. He wrote also: "Yad Yosef" and "Yad Sha'ul," on the Shulḥan 'Aruk, Yoreh De'ah (Lemberg, 1851); "Haggahot ha-Shass," critical notes on the Talmud, printed in the Slavuta (1824-30) edition of the Talmud; "Ma'ase Alfas," commentary on Alfasi, printed in the Presburg (1836-40) edition of the latter; "Sho'el u-Meshib," responsa (Lemberg, 1865-79); "Dibre Sha'ul we-Yosif Da'at," responsa (ib. 1879).